Home / EBS Product News & Features / Top 5 reasons for bass players to choose an EBS bass amp! 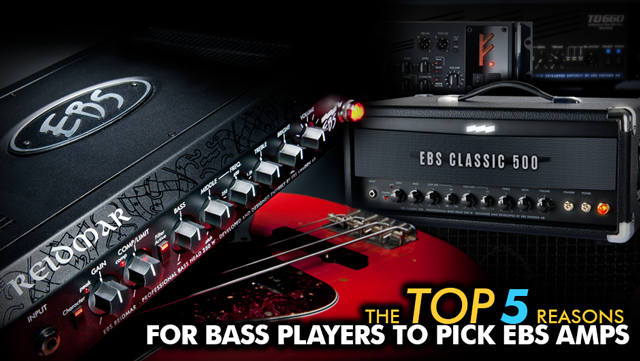 Top 5 reasons for bass players to choose an EBS bass amp! Here are the Top 5 reasons for You to consider EBS amps as the bass amp of your choice! The sound always comes first. EBS philosophy is that every instrument and musician has their own personality – a soul. A bass amp should be sensitive to your soul and not erase the characteristics of it. In other words, transparent and natural sounding. That’s the foundation for a good sounding bass amp and the hallmark of any EBS amp. When artists choose to play EBS – they choose it because they like the way they sound through it – because it sound’s like themselves. Equipment for professional use must be reliable. We may not be on the front of the barricades of technological land-winnings. Instead we refine and take proven technology to new levels to meet your demands. That formula has helped us produce reliable equipment and keep the number of service matters and warranty issues down to extremely low figures. Reports from our artists of EBS amps that has kept delivering flawlessly through 1000+ heavy-metal gigs and feedback from major backline rental companies’ makes us confident to say EBS is trustworthy gear! EBS amps are the real deal – no bull! EBS amps are the real deal – every single bass amp from EBS has been used on a major tour! From the legendary Fafner II to the lightweight Reidmar amplifiers to the Classic 500 – no exception. We make tools (not toys) to play with! Based on 30 years of experience. EBS first ever product – the EBS-1 studio preamp came out in 1988. The first three customers were Flea from Red Hot Chili Peppers, Billy Talbot from Neil Young’s band and Jimmy Earl with Chick Corea. Ever since, EBS has continued to develop amplifiers for bass at their headquarters in Stockholm, the Capital of Sweden. A bass amp to meet your needs and size of wallet. EBS range of amplifiers covers the needs of both the touring professional, the hard working session musician as well as the weekend warrior. We take your needs seriously and create amps with different values to match what you are looking for. EBS amplifiers are available in most countries, and through most of the major online shops for musical equipment. If you have trouble to find them, contact EBS for help. EBS Professional Bass Equipment – Great Tools To Play With! The Top 5 Reasons to choose EBS pedals! Sweden Rock Festival – larger than it’s line-up? !